Hear from The Memory Center’s Vilma Kaibigan about the true love she witnesses at The Memory Center and what what day to day care is like in our community. Click to see more photos and videos of The Memory Center, Richmond. Are you getting together with family this 4th of July? Holidays like these when multiple generations gather together provide a great opportunity to talk to family members about their health history. Especially family members you might not know much about or don’t see very often. Why is this important? While many factors contribute to your overall health, several common health concerns like heart disease, cancer, diabetes, high blood pressure and Alzheimer’s can run in families. Identifying what illnesses your parents, grandparents, or other relatives might have suffered from can be important for identifying your own health risks and can help guide conversations with your doctor. Most people know family health history is important, but few take the time to ask their relatives questions or write down the answers. To make this easier you can use this free website tool that creates a personalized family health record you can save and update as needed. Read more about how to keep your brain healthy, early signs of Alzheimer’s or learn more about The Memory Center programs to care for those living with Alzheimer’s and other forms of dementia. Scientists have not identified exactly what causes Alzheimer’s disease, but signs do point to certain risk factors including age, family health history and gender. While the disease affects both men and women, The Alzheimer’s Association reports 1 in 6 women over the age of 60 have estimated risk of developing the disease, which is even higher than breast cancer rates (1 in 11). New research also suggests a link between some environmental factors including heart disease, high blood pressure, diabetes and diet may contribute to developing Alzheimer’s. Aluminum has not been proven to contribute to Alzheimer’s risk. While Alzheimer’s still isn’t fully understood, there are plenty of myths about what causes the disease including using aluminum pots and pans, antiperspirants, artificial sweeteners or having silver fillings in teeth. Many factors including heredity and family history are beyond your control. But with ongoing research pointing to environmental factors most doctors recommend maintaining an active lifestyle with plenty of exercise and healthy diet – not just to reduce the risk of Alzheimer’s but a host of other health issues. Many experts also recommend social interaction and activities that keep your mind engaged. Learning a new language, reading, crossword puzzles, joining a walking group, painting or even taking a class at your local community college are examples. Visit alz.org for more facts about Alzheimer’s and how to reduce your risk. The Memory Centers are designed to care for those living with Alzheimer’s and other forms of dementia. Our daily activities focus and engage the aging mind, which eases common symptoms of boredom and agitation often seen in people with cognitive decline. Learn more about The Memory Center programs in Virginia Beach and Richmond. Considering assisted living or memory care for a loved one is often a very difficult decision, and finding the right facility is important. Not only for your loved one’s health and well being, but for your own peace of mind. When you tour facilities of course you will notice details like how clean it is, if it is well lit and in good condition. But to get the most out of your tour The Memory Center has some tips on other items to look for and questions to ask. This is an important question to ask, not only for daytime, but during the evening and overnight hours as well. The higher the ratio, the more residents each staff member is taking care of during their shift. The Memory Center’s ratio is 4 residents to 1 staff, which gives all our staff members more time to spend with residents, providing individualized attention and responding to resident needs. What Activities Are Provided? Is There A Schedule? No one wants their loved one sitting alone in a room all day bored, or in front of a TV. Activities are important in all types of assisted living and memory care facilities. Ask to see the activities schedule and, if possible, tour when activities are taking place so you can see them first hand. A sign of a good activities program is when the residents and the staff are engaged and having fun together. If you are visiting a facility specializing in care for Alzheimer’s or dementia ask if the activities are designed to encourage motion, stimulate memories and keep boredom away. Read about a typical day at The Memory Center Richmond and Virginia Beach. Mealtimes are important, as is the quality of food. Bland and boring food can get old very quickly. Ask to see a menu and note the entree options. Is there a good balance of choices and is the menu nutritionally sound? Visit the dining room and, if possible, join them for a meal and taste the food for yourself. What Is Included In The Cost Of Assisted Living? Assisted living can be expensive and what is included in a daily or monthly rate will vary from one facility to the other. Ask for a detailed list of what is, or isn’t, included so you can accurately compare and avoid surprises later. The only additional costs are incontinence supplies, salon services, long-distance telephone or transportation to an individual appointment. How Is Bathing & Personal Care Handled? How often do they bathe residents, wash their hair, help them shave if necessary? If you have bathing preferences for your loved one find out if they can honor them. Don’t forget to observe the current residents. Do they look clean and well-groomed? Are they dressed in clothing or still in pajamas well into the afternoon? What security protocols does the facility have in place to keep residents safe indoors and out – including every day safety like trip hazards. Do the walking paths have uneven footing or tree roots sticking out that could cause a fall? Are cords to lamps keep close to the wall to avoid a trip hazard? Is the space wide enough and open so residents can safely move throughout the facility? If you are visiting a memory, or Alzheimer’s care facility ask how they manage wandering and what steps they have in place to prevent it. While it is important to ask questions and gather information, based on your first impression and instinct you will probably know when you’ve found the best facility for you. If your first impression of an assisted living facility is that it is too dark and smells bad, it probably isn’t going to be your top pick, even if the food was good. 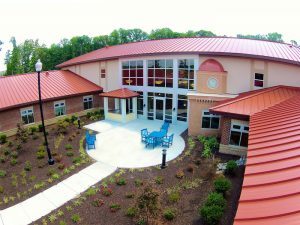 Currently the Memory Center operates two facilities, Midlothian (near Richmond, VA), Virginia Beach and Atlanta. Our communities provide exceptional care for those living with Alzheimer’s and other forms of dementia. We founded the first assisted living facility devoted specifically to memory care with a program designed to meet the challenging conditions of an aging brain with a caring, interactive community.